This is a unique townhouse in Downtown Savannah. An entertainer's delight. Victorian in architecture, yet furnished with modern flair. Furnishings from DWR, Ligne Rosset, Savannah's 24E and other Italian lines. Over 2,500 sq.ft of entertaining space. The home has solid hardwood floors, a full kitchen with double ovens, an easy flow to a large dining room with seating for 10, a large deck with both charcoal and gas grills, 2 large bedrooms upstairs with walk-in closets and en-suite full bathrooms. It overlooks the 30-acre Forsyth Park, which is the central hub of activity in Savannah. Enjoy sports in the park, or a picnic under the Cizannesque moss-draped oaks surrounding the 1858 fountain. Shopping, River Street, and all types of restaurants are within walking distance. Enjoy the eclectic coffee shop, organic health food store, and restaurants on Forsyth Park. Close to Tybee Island - Savannah's beach which is known for its pier and kite boarding. Hi, my name is Erwin Bartsch. I moved to Savannah in 1998 from Cape Town, South Africa and made it my home for the next 10 years. Coming from South Africa, I enjoy outdoors activities such as cycling, kite boarding, and running. This house is in my opinion ideally located - it has great views of Forsyth Park and i enjoy being able to watch the rugby and ultimate frisbee games from the front steps. Forsyth Park has a great atmosphere, for activities, walking, and is fast becoming the cultural stage for all kinds of concerts and events in Savannah. I further enjoy that it is not amongst the bars and shops of Broughton street. Also, parking is not an issue. Loved the Town House, the city, and the people. neighborhood when traveling to and from town. The house is very comfortable with modern decor. The bedrooms are spacious with each a private bathroom.It was nice having 2 thermostats in controlling the temperature - downstairs/upstairs. The house is furnished with most of the necessities. We brought extra wash rags, detergent, and garbage bags. We would definitely come back and would recommend the house to others. It was a perfect home away from home. The house is very well kept and equipped. The location cannot be beat. We made good use of the park and we were able to ride the free DOT bus into town eliminating any need for our car - parking was not a problem at the condo. We had a wonderful time in Savannah. Our thanks to the owner. Property was very well represented in photos. Lovely place and a great location! We had a wonderful time in Savannah. Erwin was very easy to work with and prompt to respond to any questions. I would definitely recommend this place to anybody going to Savannah in the future! Thanks, Erwin! 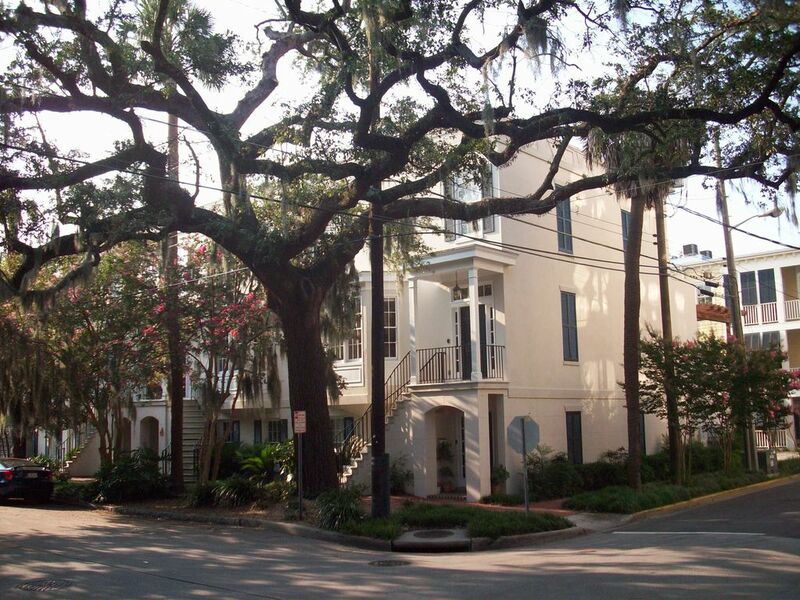 It was a very nice and well maintained property in the heart of Savannah's Historic District. The place was clean, and everything worked. Nice and roomy. Location was nice for walking our dog. My wife, her mother, my parents and I were very comfortable in the apartment. We could spread out, and not have to be in each other’s face 24/7. We all loved Savannah. Lots of great food, coffee shops, and history. Had wonderful stay in Savannah visiting family. The place we stayed at in historic district was perfect. Clean, quiet and within walking distance to many places. The owner , Erwin was most accommodating and got back to you right away. Made sure we had phone numbers to reach someone if needed. Also had nice list of things to do or visit while there. Forsyth Park was added nearby attraction. It was beautiful and we got to visit the farmers market on Saturday morning. The only thing I was disappointed in was that there were only 2 large bath towels & 2 washcloths per upstairs bathrooms. Extra towels and washcloths would have been nice. The kitchen was perfect to do some cooking to have family over. Extra kitchen trash bags would be nice to have in pantry cupboard. Savannah is surely a beautiful city! Thank you so much for your lovely review and delighted your enjoyed your stay and Savannah. Thank you for the comments regarding the extra towels and trash bags and will certainly ensure there are extra available for any future guests. Overlooks Forsyth Park. Watch the Jazz festival, Symphony in the park and other activities from the deck!